A few weeks ago, we decided to take a trip over to Great Beginnings in Gaithersburg to check out the behemoth baby store with our cousins and start looking at furniture for our new addition. 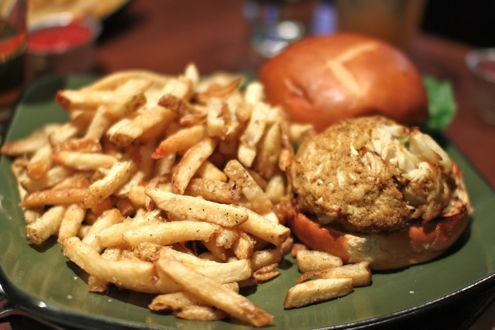 After being completely overwhelmed and famished, we tried to think of a place nearby that would be fun to go for an early dinner, and the recently-opened Founding Farmers in Park Potomac came to mind. 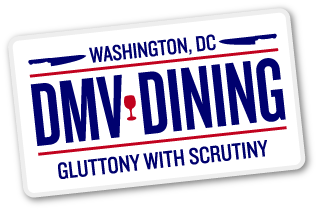 It’s been years since we have been to their DC location, and we have wanted to try to this suburban outpost for some time now. Because we arrived so early for a Saturday dinner, we were seated right away, and by a TV no less so we could watch the Caps – Bruins game. (Yes, we’re just a little behind on this post…). The menu itself can be fairly overwhelming, with so much to choose from between the small snacks to share, appetizers, salads, sandwiches, entrees, and more. We decided to share the popcorn of the day, which was ranch flavored, as well as the table biscuits with honey butter and tomato jam. The popcorn was tasty but the flavor was a little too overpowering, and while I enjoyed the biscuits, they were also a little dry. As for entrees, Brett decided to go for the spicy ahi tuna poke salad, which I jealously eyed throughout the meal. Prepared with cabbage, avocado, fried wonton, spicy cilantro-lime vinaigrette, and Kung Pao dressing, Brett was very impressed not only with the artful presentation but how satisfying the salad was. 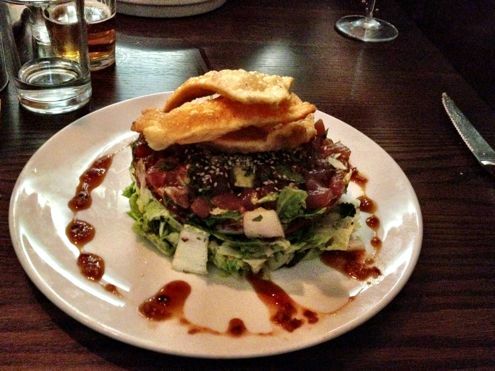 The rare tuna was very fresh while the crispy wonton added a nice crunch to the dish. 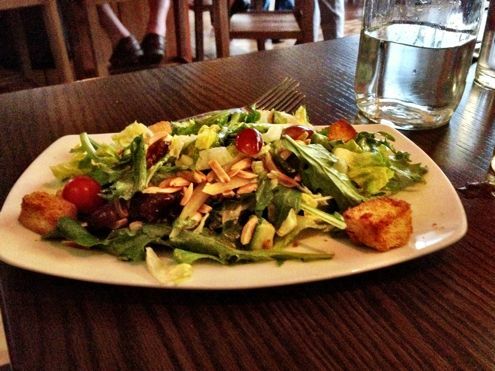 He’s not a big salad person but he remarked how he would definitely order this again. I had a baby shower earlier in the day at Black Market Bistro so I wasn’t that hungry (I know, poor me). I decided on their roasted tomato soup and an order of their Farmer’s Salad, which was comprised of baby lettuce, avocado, dates, tomatoes, red grapes, almonds, parmesan cheese, and a champagne vinaigrette. I was worried that it may be too small but it was actually a decent size, and I even took some home with me. I loved all the ingredients and if I was hungrier, I would have seen if it was possible to order it in a larger size. 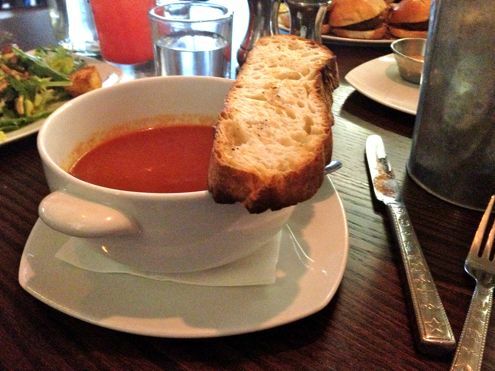 The tomato soup had a nice kick to it, and Brett gladly helped me finish the large bowl. 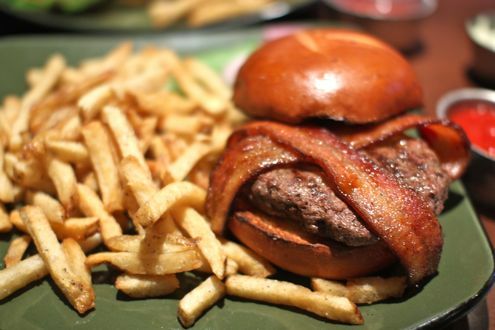 What’s so great about a place like Founding Farmers is that you can go several times and never get the same thing. I have been to breakfast at the downtown location a few times and would love to come back here for brunch to try items such as the New Orleans French toast or the red velvet pancakes. Oddly enough, we happened to be there on a prom night for one of the local high schools, so there were lots of kids dressed up which made for great people watching. Some critics might knock a place like this for overreaching with too many items on the menu, or questioning just how “farm-to-table” the ingredients really are, but we were happy with our meal and feel like it’s a nice addition to the growing list of restaurants in Potomac. With the addition of the new hot spot Sugo, it might be harder to find parking in that lot than at some places downtown. 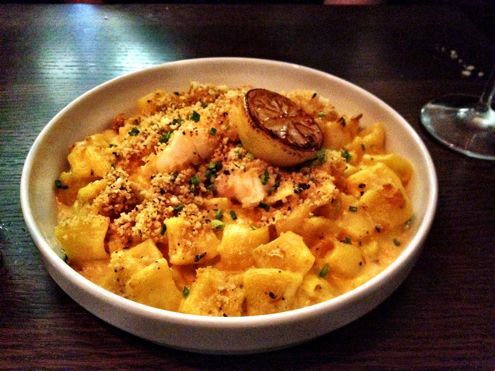 Oh and in case you’re wondering, our cousin tried the $28 lobster macaroni and cheese and while it was decadent, it would definitely be better as a side dish than as an entree. A whole cast iron plate of lobster and a gouda-cheddar gratin with pasta is just a tad too hearty. Last weekend we had the opportunity to check out the District’s latest entrant into the tapas market, New York’s Boqueria. Their first location outside of NYC, Boqueria is the latest import from the city, following in the footsteps of Carmine’s, Hill Country, and Shake Shack. And while DC uber-chef Jose Andres has not one but three locations of his wildly popular Jaleo restaurants in the area (not to mention one in Las Vegas), we entered Boqueria with an open mind and an empty stomach. When we were seated for our 8pm reservation, it was a tight fit for the three of us (Rachel had a friend visiting from out of town) considering the table was suited more for a couple at best. In fact, another party of two actually declined sitting at the table next to us because of this very issue. It was also a Saturday night, so the place was understandably busy, but they were obviously trying to maximize as much space as they could. Also, a reservation is highly recommended on the weekends considering the wait was an hour and a half otherwise. We started the evening off with a pitcher of their red sangria, and while it was rather refreshing, it tasted like there was barely an ounce of alcohol in the entire jug. If you’re splitting an entire pitcher between two people and neither of you feel a buzz, there’s something wrong. While the beverages were a letdown, the food was not. 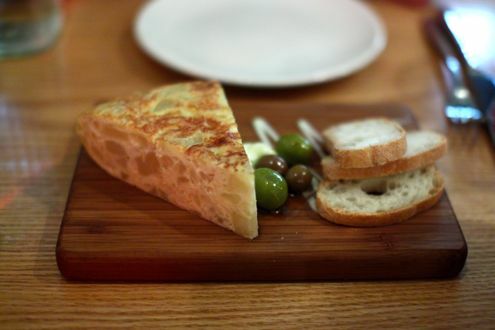 Our first plate was the traditional Tortilla Española. I’m a big fan of Spanish omelets and Boqueria’s take on the dish was very enjoyable. Light and fluffy, it came with a side of olives as well as some bread and butter. 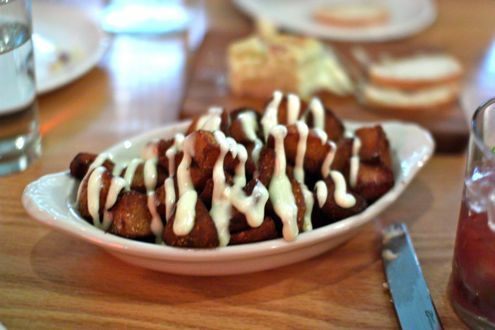 The patatas bravas were so crispy that they almost resembled tater tots. The blend of the salsa brava and roasted garlic allioli saved the dish as it added a nice kick to the potatoes. It was also a generous portion as there were plenty of patatas to go around for three diners. The Pintxos Morunos, or Colorado lamb skewers, were excellent. 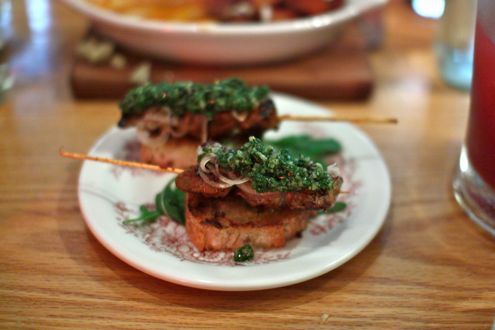 Topped with salsa verde and accompanied with pickled shallots, the seared lamb was tender and flavorful. 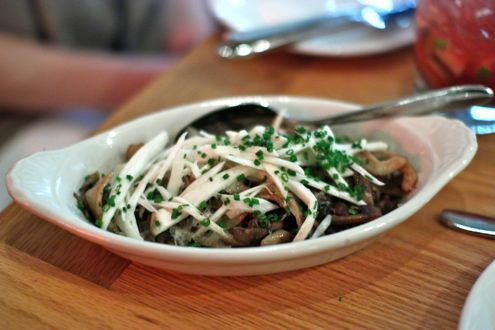 The sautéed wild mushrooms were also a hit amongst the table. Prepared with Manchego cheese and thyme, the serving size was more than adequate. It proved to be a great side that had a lot of flavor without being too filling. 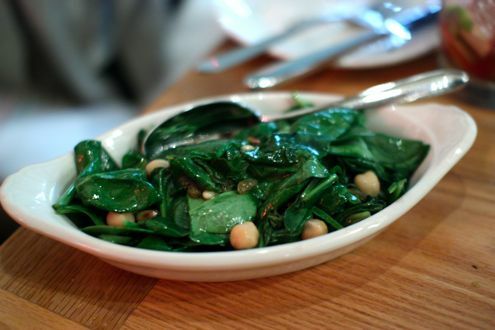 Speaking of side dishes, we also ordered their sautéed spinach. Prepared with garbanzos, pine nuts, garlic, and raisins, this was another solid offering. 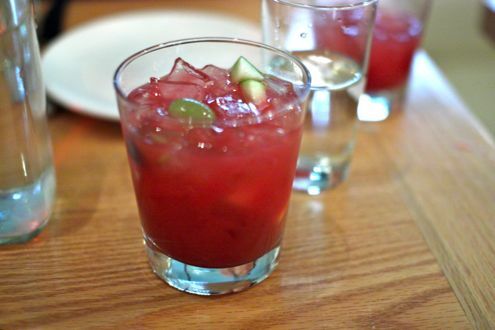 It became evident throughout the meal that Boqueria’s vegetable tapas not only provide a great value with their large portions, but that they’re also finely executed. And while the grilled baby squid was very good, the amount of txipirones actually served was something left to be desired. It was more of squid salad than anything. 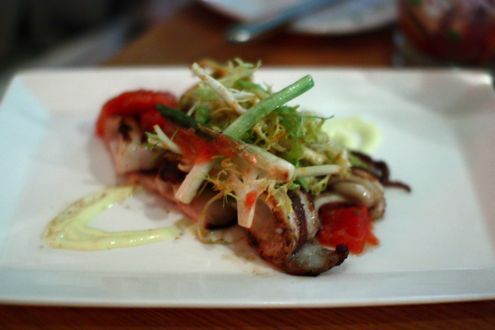 Served with frisée, romesco vinaigrette, tomato confit, and crispy scallions, the pieces of squid were far and few between. Just when we thought we were full, we ordered the Torrija y Helado for dessert. 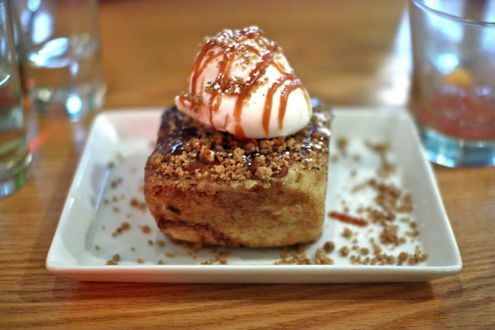 A caramelized Spanish toast topped with yogurt ice cream, it bore a slight resemblance to bread pudding. After tasting it, however, we quickly realized that it was even better. The caramelized coating provided a crunchy texture on the outside, but the inside was warm and gooey. The yogurt-flavored ice cream provided a nice balance and made for an overall impressive dish. If there’s one dessert you should order at Boqueria, it’s definitely this. Overall, we were very pleased not only with our food but also with the service. The dishes came out a balanced pace while our plates were continuously cleared without feeling rushed. Considering we ordered seven plates and a pitcher of sangria, our bill came out to a little over $100 for three people. That’s not bad at all considering how full we left the restaurant. It’s a great addition to the tapas scene in DC, but we’ll be sticking to wine as our libation of choice on our next visit.